Researchers led by Drs. Jerry Silver and Alex Y. Huang at Case Western Reserve University School of Medicine used Imaris software together with time-lapse multiphoton microscopy to visualize the axonal injury that occurs after spinal cord trauma in living mice. When the spinal cord is injured, an initial dieback of axons during the first few hours is followed by a secondary phase of axon death over the following weeks. The researchers wanted to learn more about this secondary phase because understanding the mechanisms that cause axonal injury to increase during this phase could lead to treatments that decrease additional functional deficits that occur as the lesion size and damage increases. During the secondary period of dieback, axons approaching the lesion lose parts of their membrane as the size of the lesion increases and it is infiltrated by blood-derived immune cells, including macrophages. To analyze this immune process, the researchers acquired intravital real-time multiphoton microscopy images of the interactions of GFP-labeled macrophages and GFP-labeled microglia with YFP-labeled axons in a mouse model of spinal cord injury. On the day of spinal injury and 2, 4, 5 and 8 days after, the researchers acquired 3-D images covering the top ~150 microns of the spinal column with a z-step size of 3 microns. Blood-derived CX3CR1+ macrophages have greater average speed and displacement than resident microglia. 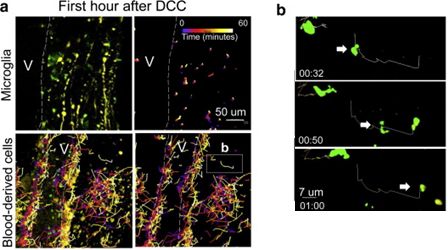 a) Immediately after dorsal column crush (DCC) lesion, Cx3cr1+/GFP microglia move only very short distances, while blood-derived cells traversed over great distances within the center of the lesion. Cell tracks are shown as color-coded time stamps (blue: time = 0 min; yellow: time = 60min; gradient shown in the figure). Both tracks and fluorescence are shown in images on the left, and only tracks in images on the right. Scale bar= 50 microns. Total time for tracking is 1 h. b) High-magnification sequential images of one macrophage's track and movement in a. Scale bar=7 microns. Time stamp: h:min. Total time shown is 28 min. Reprinted from Evans et al. Exp Neurol. 254:109-20. The researchers used the Imaris Spots Function for automated and manual counting and tracking of multiple well-defined cells in three-dimensional space. They also used Imaris to conveniently examine the time series of z-stacks to observe changes in 3-D structures over time. With Imaris, they could cut these stacks at different angles and to different thicknesses to easily view movement of structures within the stacks over time. Axonal destruction occurs in response to contact only with Cx3cr1+/GFP blood-derived cells and not Cx3cr1+/GFPmicroglia. a) Example of contact between a Thy-1CFP/+ axon (yellow) and a Cx3cr1+/GFP blood-derived cell (green) resulting in axonal “blebbing” (white arrows) on day 5 after DCC injury. Blebbing occurred in two locations of the axon (yellow). Reprinted from Evans et al. Exp Neurol. 254:109-20. Overall, the analysis revealed that blood-derived macrophages but not microglia facilitate secondary axonal dieback that occurs in traumatic spinal cord injury. The researchers continue to use Imaris for many ongoing projects, including 3-D tracking of cell movement in many different tissues such as the brain, bone marrow, lymph node and other areas.